To an old-timer living in the Pacific Northwest, smelt can bring back memories of glorious fish runs. For many families, annual smelt dipping was a social and recreational activity, and they came from miles around to net the smelt for frying and smoking. No one knew actually when the schools of smelt would come until someone spotted the first fish. When the announcement was made that “the smelt are running,” everyone made a mad dash to the river. The smelt runs were so large through the 1930s and 1940s, that there was the illusion the runs would be annual events. But the runs started becoming irregular and eventually stopped in some rivers, especially in the 1990s. Only a few now make the migration up the Columbia River. No one knows what went wrong, with the smelt runs. Among the possible reasons for the decline are the warm-water El Nino ocean conditions, water pollution from pulp mills, and the changes to the river estuary caused by channel dredging and construction of jetties and dams. The river temperature at the end of March may have an effect on the timing of migration upstream to their spawning grounds. A water temperature of approximately 40 degrees F. was found to be necessary to insure upstream migration in the Columbia River. This spirit of the smelt fever still continues whenever the fish decide to appear in the rivers of the Pacific Northwest. I remember, as a boy of twelve or thirteen, smelt fishing with my father on the Sandy River. We fished from a wooden float supported by oil drums and anchored to the bank where the water ran 10 to 12 feet deep. 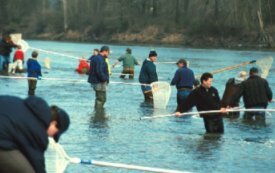 Large nets, 2 feet in diameter and up to 4 feet long, attached to a 16-foot-long poles, were dipped downstream to intercept the upstream migration of these thick schools of silvery fish. Sometimes the schools were several feet in diameter moving in undulating fashion through the current, never following the exact same route more than a few seconds. The trick was to locate the school by the feel of the fish hitting the steel rim of the net and then rapidly stroking downstream to intercept as many as possible. On a good dip, as many as 50 pounds of fish could be intercepted, requiring more strength than I had to bring them to the surface. Smelt, also called eulachon or oolichan by Native Americans, are small, silver fish the size of herring (approximately 6 to 10 inches long). Each spring they migrate in millions to coastal rivers from the Klamath River in northern California, north to the Nushagak River in Alaska, and to the Pribilof Islands in the Bering Sea. After spawning, most die, their carcasses decay, and they thus enrich the streams and estuaries. Another nickname is “candle fish.” This nickname comes from the fact that the smelt are so full of oil that when dried, placed upright, and lit, the fish would burn from end to end like a candle. 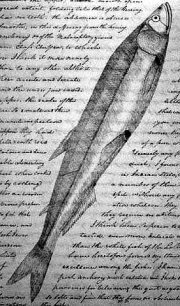 To Native Americans, the return of the eulachon meant the beginning of spring and a renewed food supply, literally saving lives and earning them the name “salvation fish” or “savour fish.” They were the first fish to arrive in the river after a long cold winter when most of their stored food supplies had been depleted. Unlike other fish oils, eulachon lipids are solid at room temperature, with the color and consistency of butter. These fish are almost 20 percent oil by weight, allowing a fine grease to be rendered from their bodies and creating a high-energy food source that could easily be transported and traded with other tribes farther inland. The name “Grease Trail” was given to these travel routes, because the most important trade item carried over them was the eulachon oil extracted from the tiny fish. In the 1700s a vast network of ooligan “grease trails” stretched from Alaska to the Fraser River, even crossing the northern Rockies. These ancient “Grease Trails” later formed part of the Dalton Trail, a toll road that opened up the interior of Alaska to prospectors during the Klondike Gold Rush from 1897 to 1898. In 1793, when Alexander Mackenzie (1764-1820) made his famous overland journey to the Pacific Ocean, he followed an ancient “Grease Trail” from the Upper Fraser to the Bella Coola. Alexander Mackenzie, considered Canada’s Lewis and Clark, was the first European to cross the Rocky Mountains and view the western seas from the shores of northwestern North America, preceding the more widely known Lewis and Clark expedition by 12 years. His journey took him 72 days and covered over 1,240 miles (2,000 km) of unmapped terrain. Today parts of the ancient trail form the famous Alaskan Highway. The Indians of the Northwest were known for their great wealth, and nutritious ooligan oil was one of their most valued trade goods. Some of the greatest potlatch ceremonies were ooligan ‘grease feasts,’ and ooligan also was a medicine. Tribal chiefs would hold “grease feast . . . in order to destroy the prestige of the rival” chiefs. The ooligan grease feast was the most expensive of all the feast, “at which large quantities of fish oil (made of the oulachon) are consumed and burnt . . . “During a grease feast, the central fire is built up to the point of scorching the guests in order for the host to conquer them, and “grease is poured into the fire so that the blankets of guests get scorched.” This serves to raise the prestige of the host who can afford to give such a feast, expending enormous quantities of the valued resource. If the rival chief is not able to respond with a similar potlatch and destroy an equal amount of property, then his name is “broken” and he suffers a loss of prestige. Their general recipe is to allow the fish to ripen for approximately two weeks under evergreen branches, cook the fish in fresh water, and then skim the oil from the surface of the water. Specific recipes differ in the dumping and stirring of the fish, straining the carcasses, placing rocks in the water to reheat the mixture, and filtration methods. Whatever method used that is unique to the individual tribe, those involved in making the oolichan grease were, and still are, proud of the end product. The grease was, and still is, shared and sometimes given away as a gift. The valuable and nutritious end product is used on many foods; salmon, halibut, herring roe, and berries, similar to the way butter is used. The grease was used for trade with other First Nations that did not harvest oolichan. Indian Trade Routes Lead to Overlooked Origin of ‘Oregon’, University of Oregon, Eugene OR, 2003. Oolichan Home Page, Haisla people of the Kitamaat Village. Ourigan, Wealth of the Northwest Coast, by Scott Byram and David G. Lewis, Oregon Historical Quarterly, Summer 2001, Volume 102, Number 2. She Who Watches, Tsagaglalal, by Rick Rubin, Oregon Culture Heritage Commission. The Ghost Run of the Cowlitz, by Richard A. Hinrichsen, Cowlitz Historical Quarterly, 1998, Volume 40, Number 2, pages 5-21. Some macho folks will fry these silvery fish without benefit of cleaning, since the fish have eaten nothing since leaving the ocean some 80 miles away, but I have always preferred cleaning them as you would a trout and frying the cleaned smelt in butter until nearly crisp. Grabbing the tail and using a fork, neatly separate the backbone from the meat. This will leave about two good mouthfuls per fish. 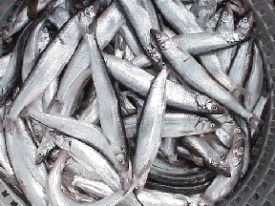 Most people will eat 15 to 20 smelt before calling it quits. Rinse cleaned smelt under cold running water and pat dry with paper towels. Sprinkle fish cavities with salt and pepper. Place flour in a shallow dish. In another shallow dish, pour the lemon juice, dip both sides of the smelt in lemon juice, then coat both sides with flour. In a large frying pan over medium-high heat, melt butter; add the smelt and fry for 2 to 3 minutes, turning once, or until fish is lightly browned and flakes readily when prodded with a fork. Remove from pan and drain on paper towels. Place smelt on a platter, garnish with lemon wedges, and serve immediately. I am going to clean my hooligan by heading them and taking the guts out then splitting them and then brine my hooligan in brown sugar, salt, sake, mirin, soy sauce, and some hot chili pepper flakes then I am going to dehydrate them for a day. After you seasoned then dehydrated the smelt for a day, do you eat them that way or fry them first? Check out the recipes on the Smelt web page.